. . . seeing the world, one day at a time . . . If Paris and Chicago had a love child, it would be Porto. Parts of the city are as elegant and sophisticated as a Parisian woman, while other parts are as rough and ready as a Chicago longshoreman. 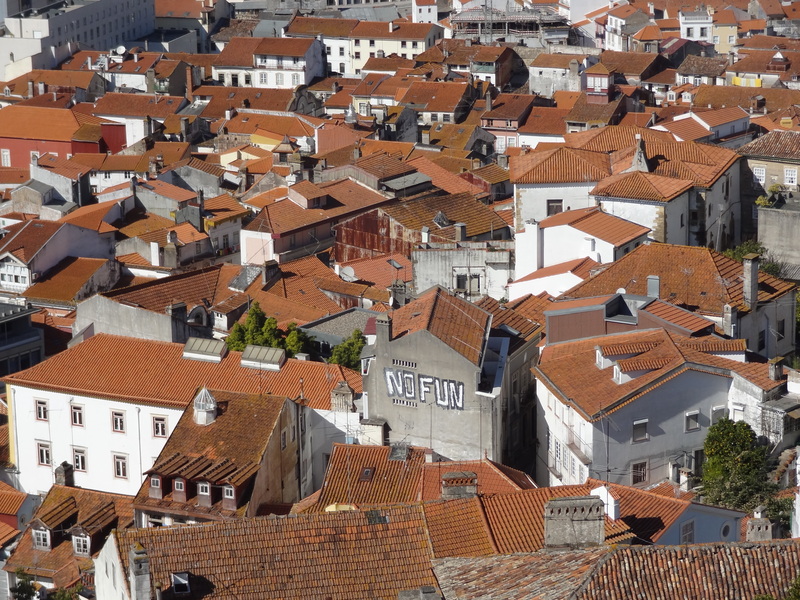 Porto is a city that works hard, and plays harder. The city’s theatre lives in the streets not in the palaces. The bohemians are tolerated of course, but the city’s eye rarely strays from the river which is its “meat and potatoes”. Yet at day’s end, there is always time for a song and a glass of port. 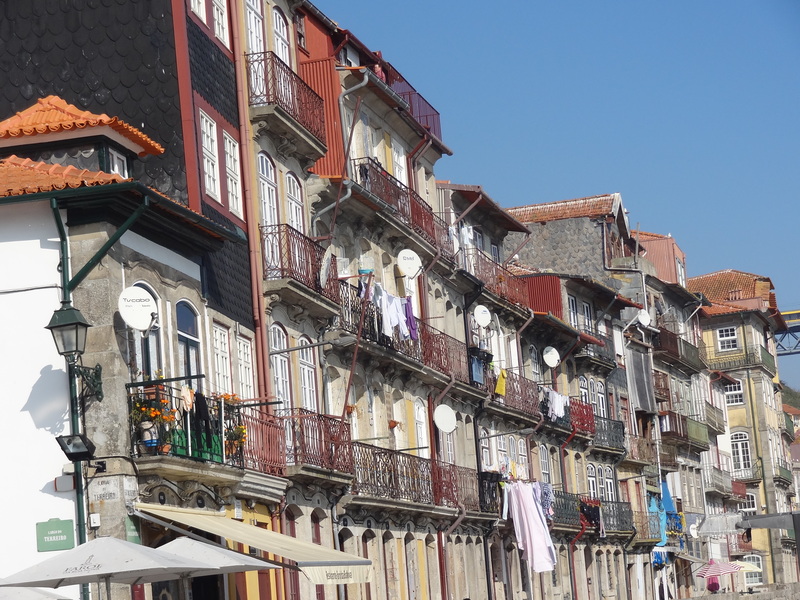 Lisbon may have more tourists, but if you want to experience the real Portugal you must visit Porto. Bring an open mind and you’ll see beyond the city’s stormy, brawling exterior to its inner majesty. P.S. If you do make it to Porto eat a hearty Francesinha (a warm sandwich that originated in Porto); and when the meal is done, toast the city with a glass of port. Remember to leave a little room for some pastel de nata too! 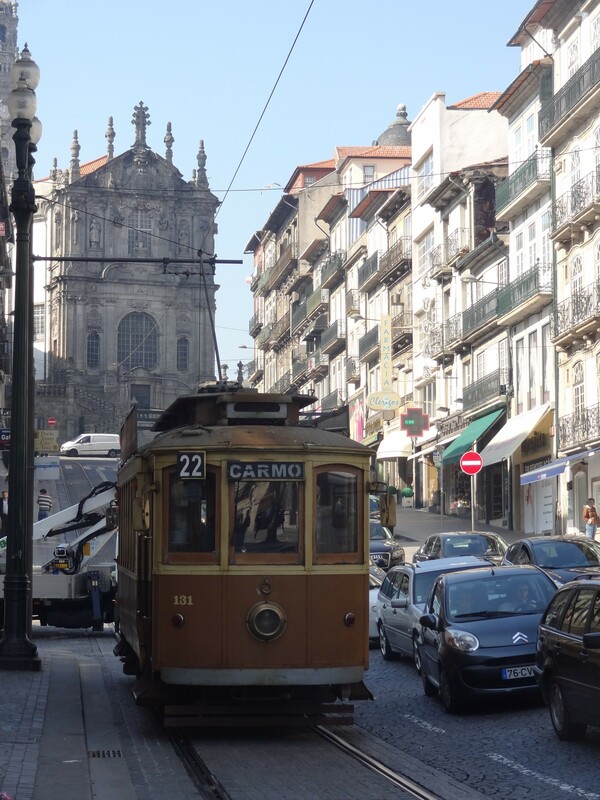 Unlike it's pretty sister, Lisbon, Porto rolls up its sleeves and works! This commercial street is only quiet on Sundays, during the rest of the week it is buzzing with energy. 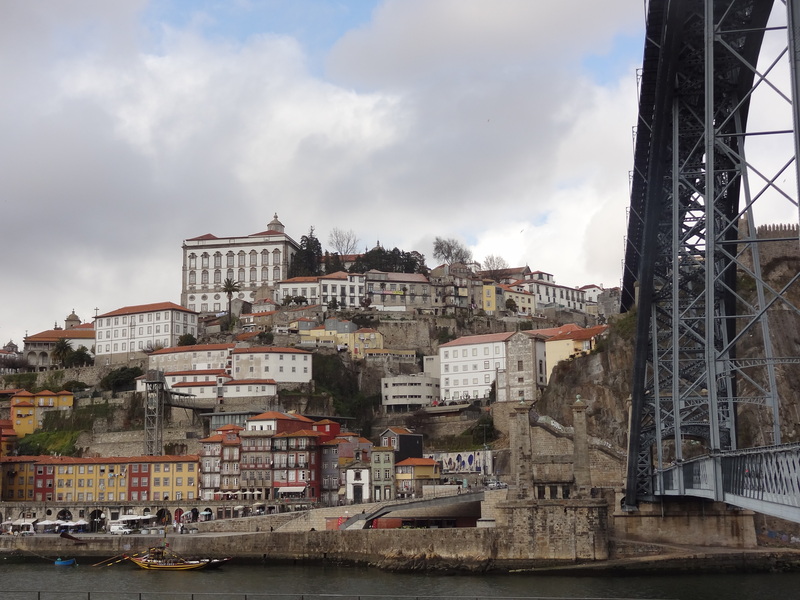 The Porto Riverfront is so unique that it has become a UNESCO World Heritage Site. The area's colourful buildings and medieval streets create a wonderful ambiance. Some travelers comment on her fading beauty suggesting that she is past her prime, but to us she is the "Cher" of cities. Porto's Dom Luis I is an important "bridge" that brings Porto (riverfront) and Gaia (the left bank) together. This connector allows access to the Port Lodges like Sandeman, Ramos Pintos, and Taylor. 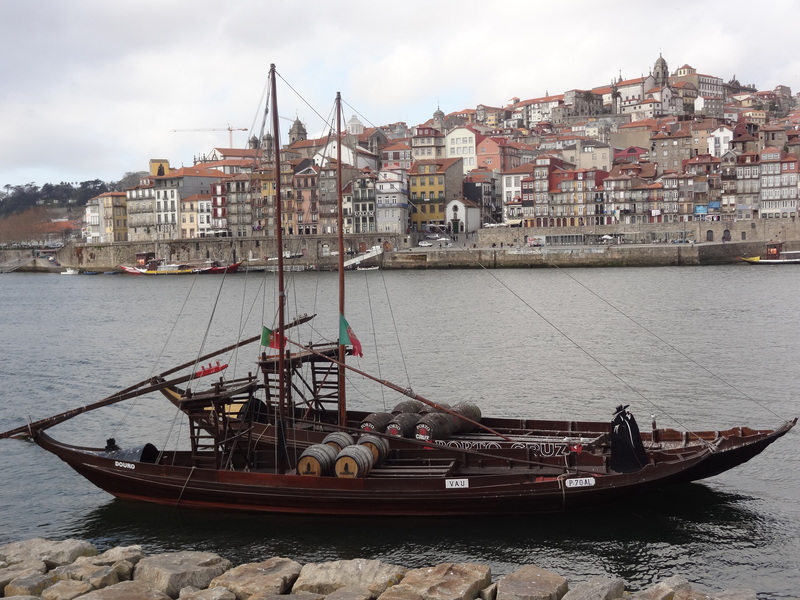 These boats (barcos rabelos) used to sail up and down the Douro River delivering port wine throughout the city. Port is a fortified wine that is sweet and is often served as a dessert wine. 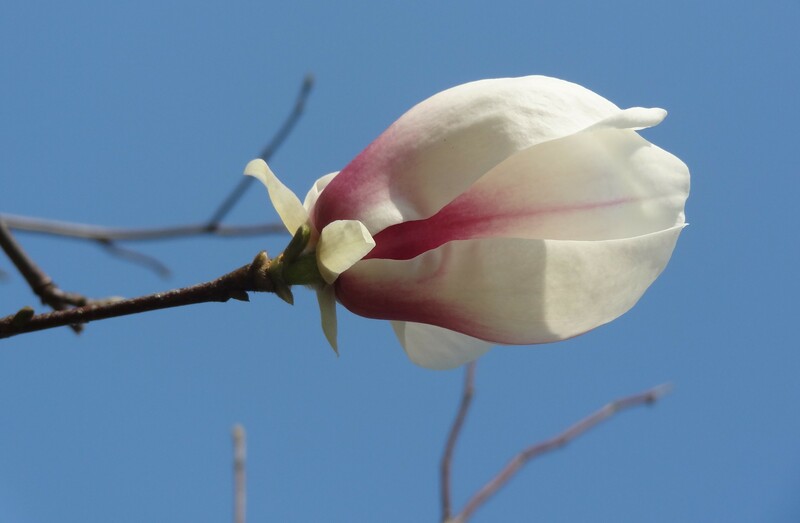 It's usually red but there are white varieties as well. Some people suggest Port and Brandy are the same thing, but the Portuguese would disagree. And rightly so! The Church of Saint Francis is found in the heart of the old city. 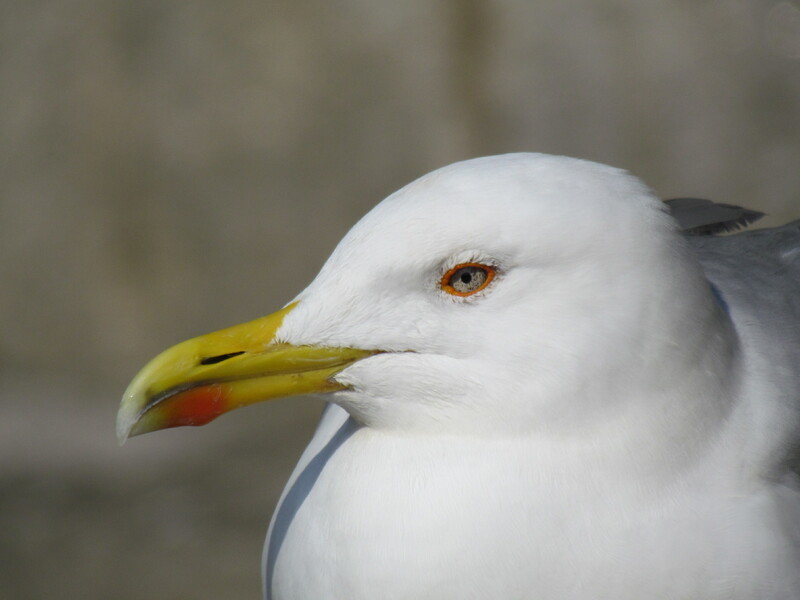 It offers great views of the city's rooftops. 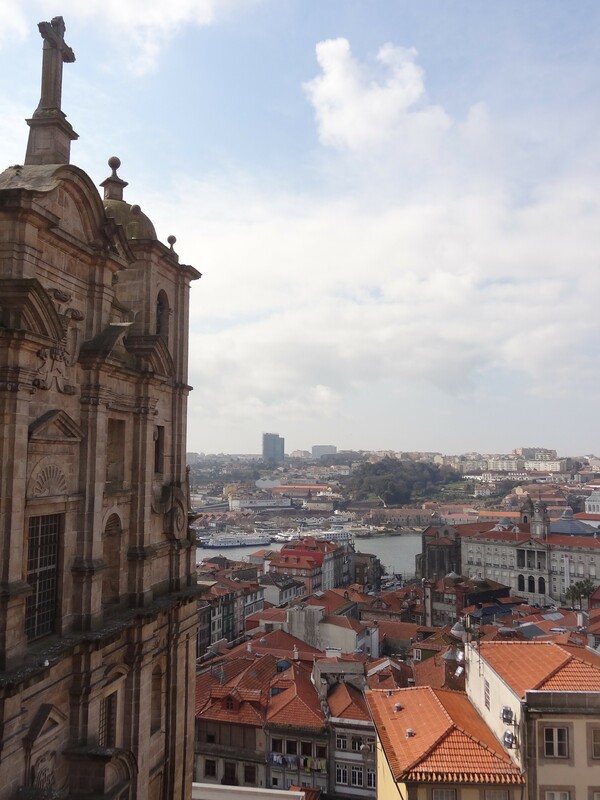 Also, it is home to Porto's catacombs, which you can visit. Some of the crypts are numbered and still have Oporto family names printed on them. 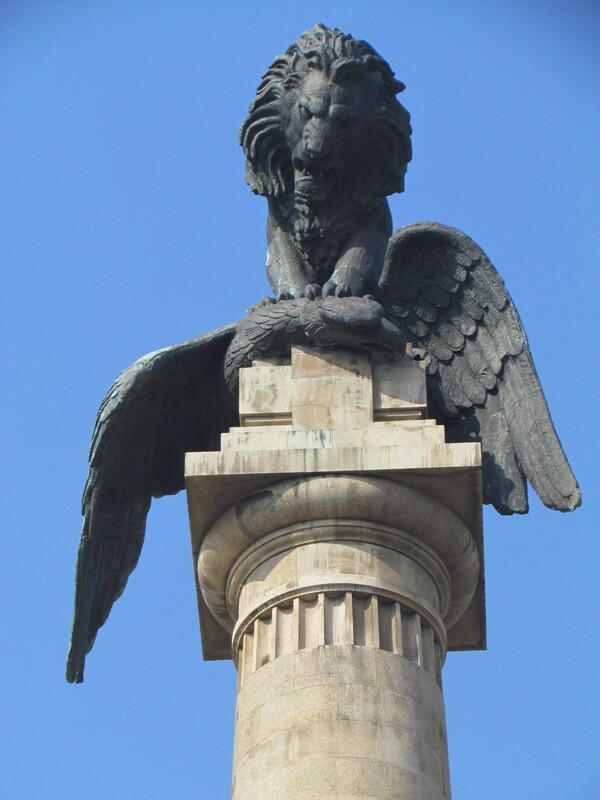 The lion (which represents the British and the Portuguese) is dominating the eagle (which represents Napoleon and his French troops). 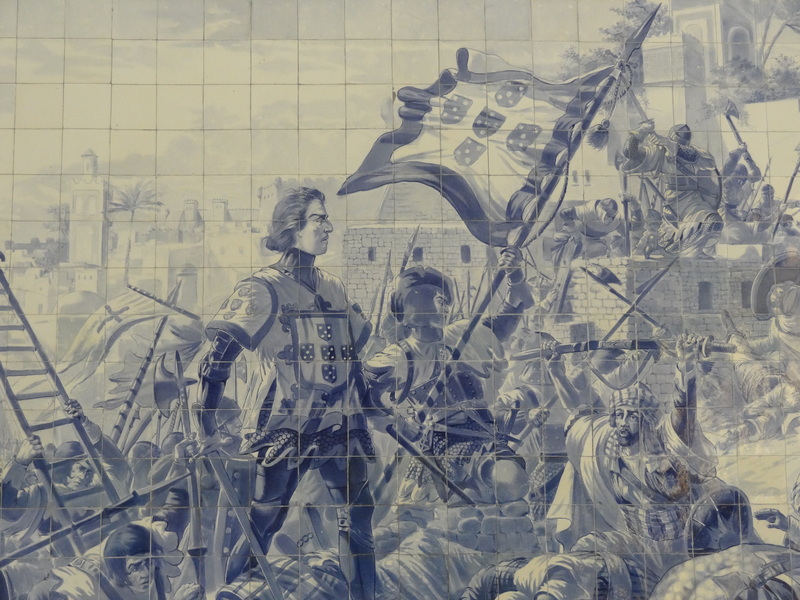 Even today the Portuguese and the British have close ties. Many British citizens holiday or live in Portugal. If you visit Porto, the São Bento Station (Train) is a must see. The beautiful azulejos / tile murals are amazing. This photo captures daily life as it once was in Portugal. 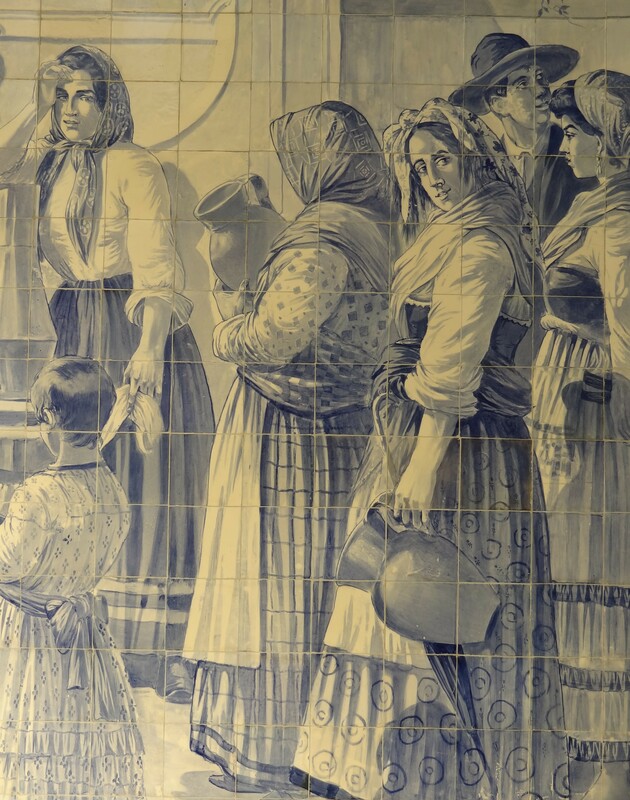 This is another azulejos mural from the São Bento Station. This one highlights an historic battle. Throughout the city you can find many of these wonderful murals. Forget Starbucks! 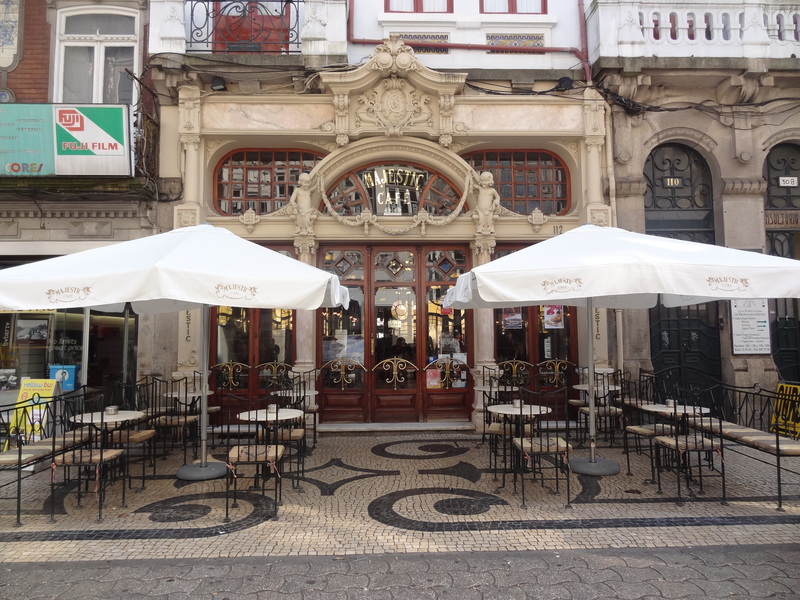 This gorgeous art nouveau café should be your first stop in Porto. 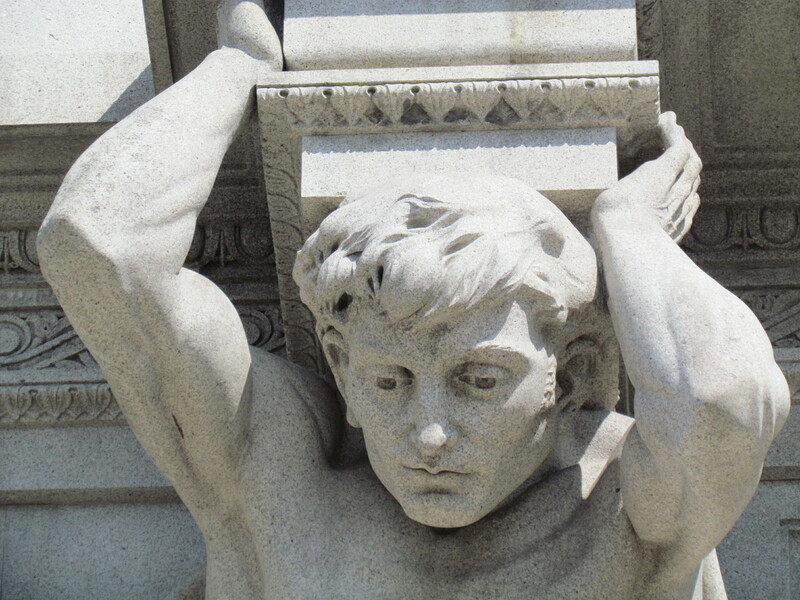 When it opened in 1921 it was meant for society's most elite members but few visited it. After the name was changed from Café Elite to Café Majestic it became popular with intellectuals, bohemians and the wealthy. Many heated debates were held here while her visitors drank tea or ate ice cream. Today the debates continue over coffee / tea and pastries. A Francesinha is a hearty sandwich (with egg, cheese and meat) that originated in Porto. It is served warm. It also has a distinctive sauce (which can be a little spicy) that is drizzled over the sandwich. Yum. Your melodic voices are impressive, and you never missed a line! Wow! I’m blown away. I bet you also know this song is accurate in its description of Lisboa too. It mentions a hill, cable cars, fog, and sun. 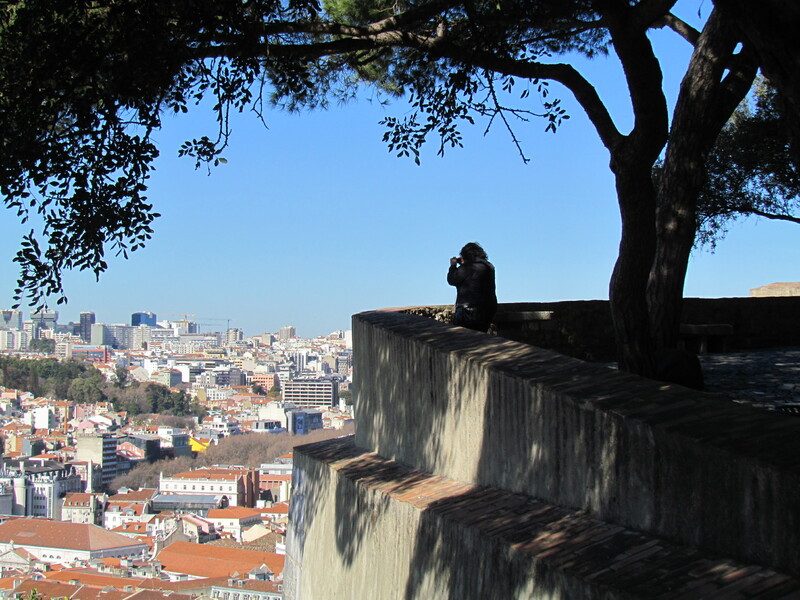 Like San Francisco, Lisboa is known for its steep rolling hills, eclectic architecture, and famous landmarks. Yet there are subtle differences. While San Francisco is known for its sour dough and hippies, Lisboa is known for its tarts and hippies. 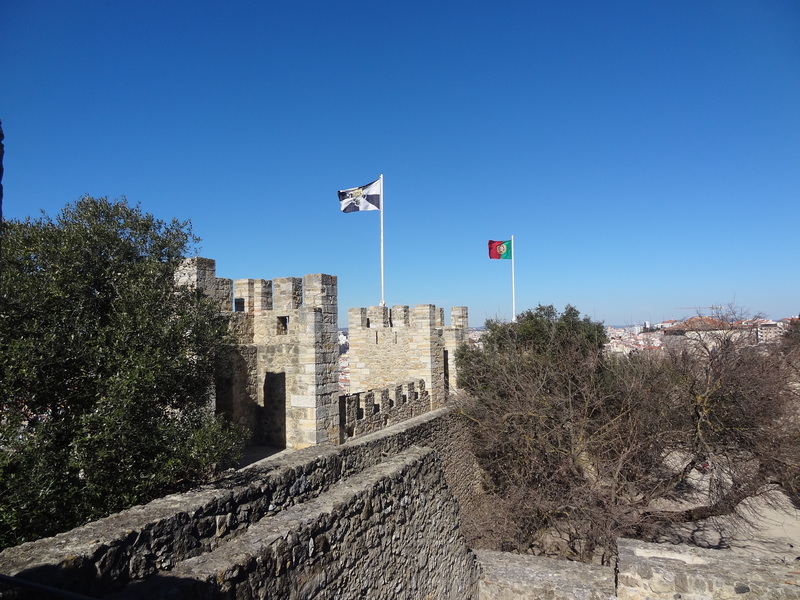 While San Francisco is wine country, Lisboa is castle country. C’mon let the pictures lead the way. After viewing them, I am sure you will lose your heart in Lisboa too. One of Lisboa’s most famous neighborhoods is Belem. This neighborhood is home to many great sites. You definitely want to pop in for a visit. The cloister is a photographer's paradise. The unique late Gothic architecture, along with the gargoyles and the white stone against the blue sky, is stunning. 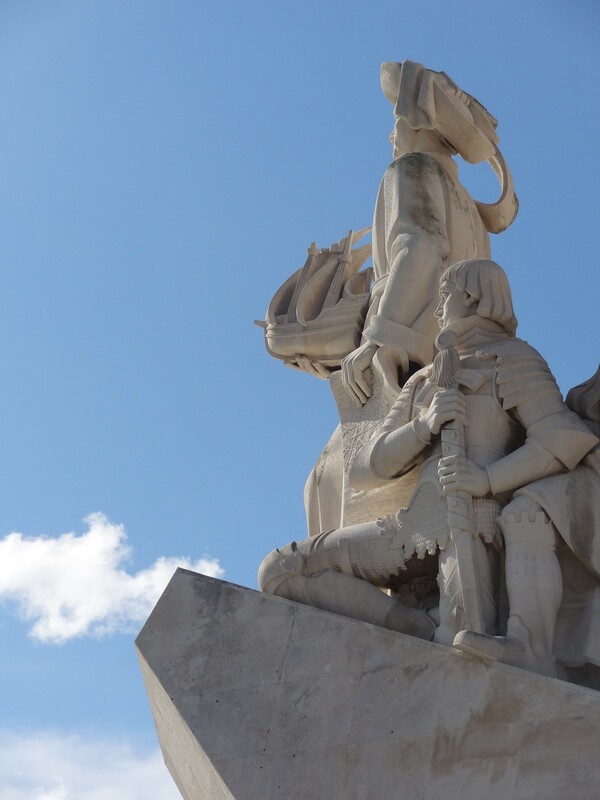 The Discoveries Monument, built along side the Tagus River, honors Portugal's famous explorers and its great Age of Discovery. 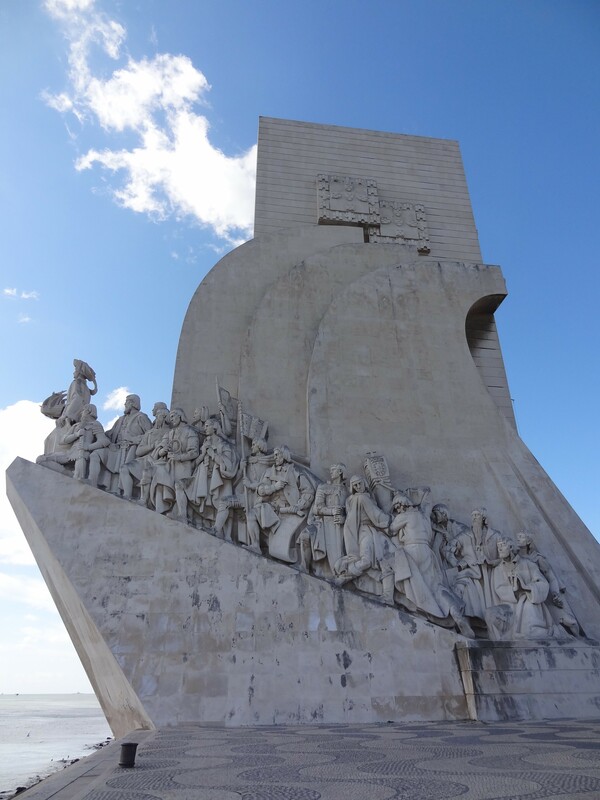 The monument features both patrons and explorers associated with Portugal's Age of Discovery. Shown here are Henry the Navigator and King Alfonso V, patrons of Portuguese exploration. Vasco da Gama comes right after the king ... if you look closely at the picture of the complete monument (above) you should be able to spot him. This Moorish castle is perched on top of the steepest hill in Lisbon, and presides over the city like a fortified guardian. It is one of the city's most popular tourist sites. After the gorgeous city views, the best part of visiting the castle involves climbing its walls! From St. George's most popular viewpoint you can see for miles. Lisboa is very picturesque and, as you can see, many photographers stand here in order to capture the city's gorgeous landmarks. 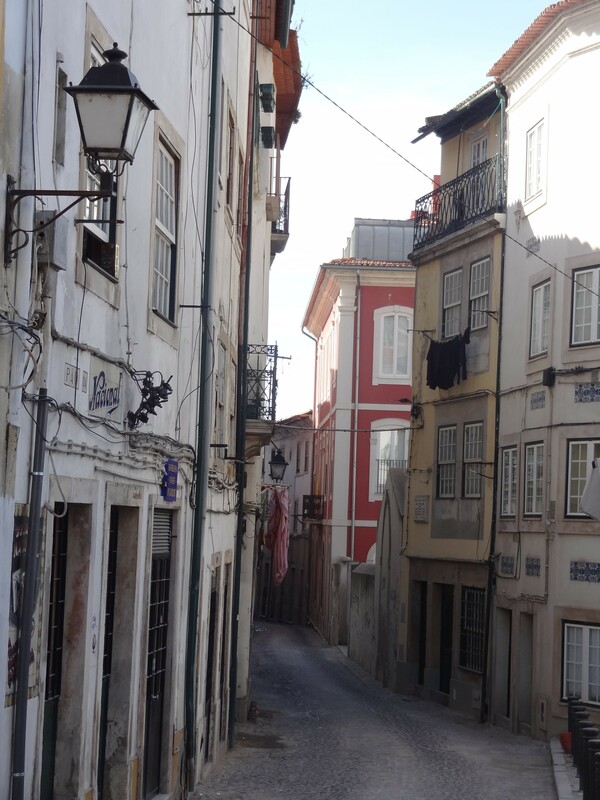 Chiado is another popular neighborhood, which is found in the upper city. 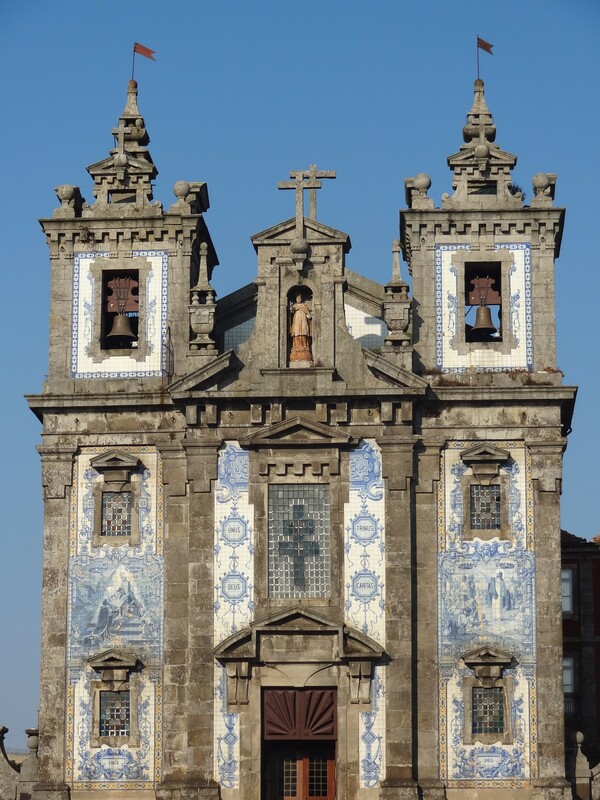 For fun take the Eiffelesque Santa Justa Elevator up to the Carmo Museum, later dine at the Cervejaria da Trindade, a former monastery that has been turn into a beer hall and seafood restaurant. Yum. 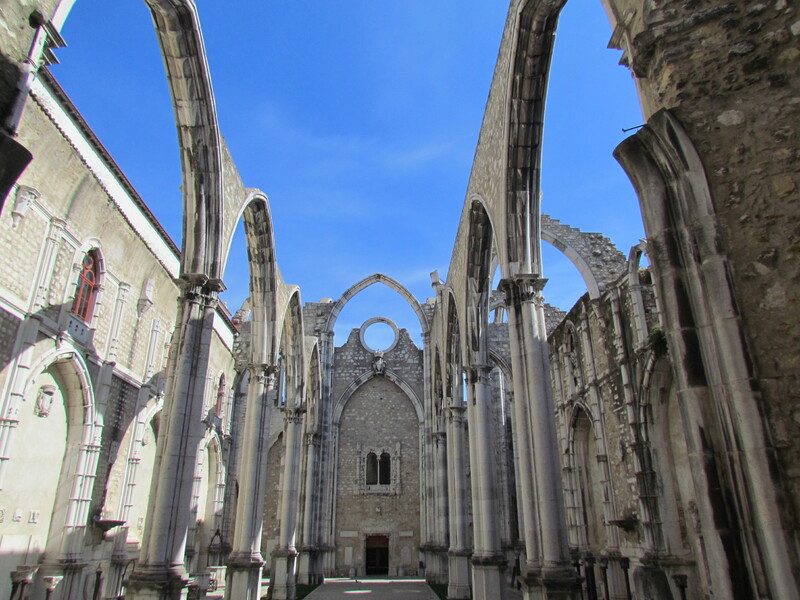 In 1755 the church was almost completely destroyed by a earthquake. Today it is a museum but a good portion of the church's structure is still intact. It's roof is long gone but for some strange reason it makes this site even more beautiful! 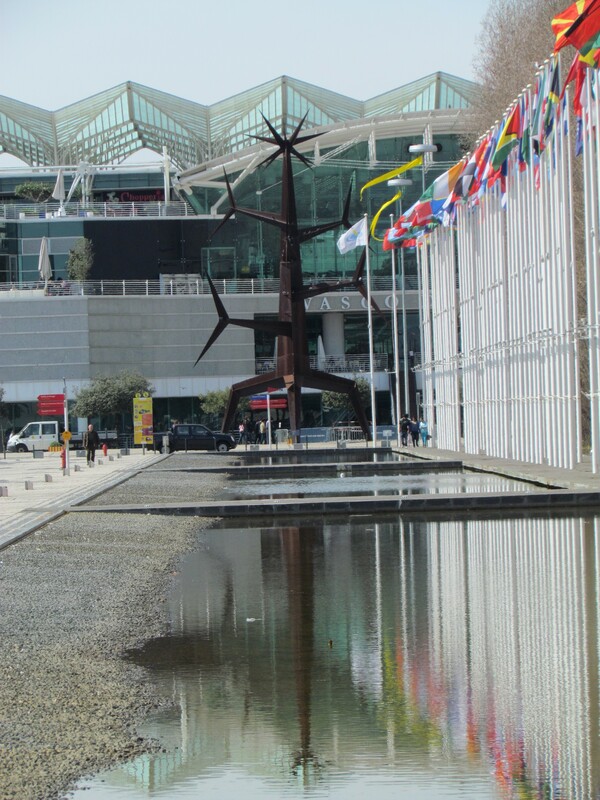 In 1998 Lisbon hosted a World Expo. The end result of this expo is a new and modern neighborhood! There is a shopping mall (you can see it's unique roof in the background), an aquarium, quirky art, a gorgeous views of Lisbon's suspension bridge and river walk. 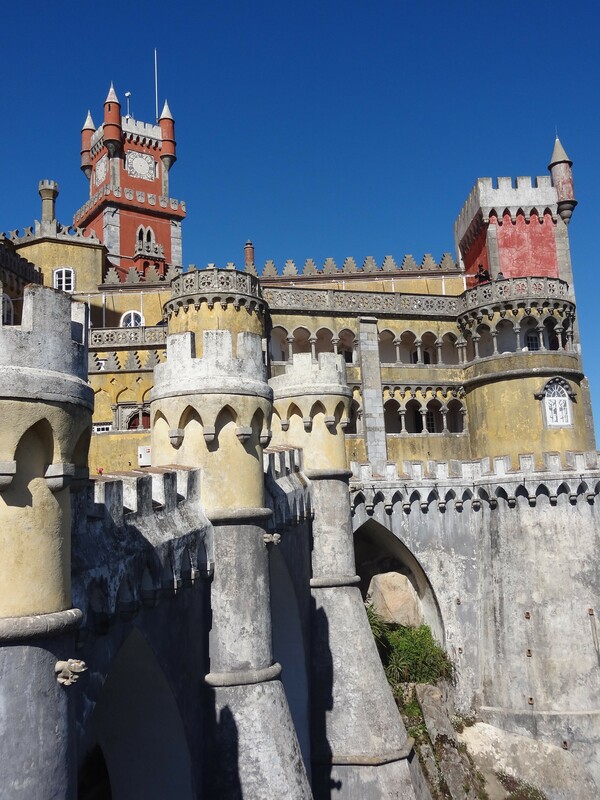 Lisboa’s great location allows for great day trips … hop a train and visit castle country by stopping at Sintra first. 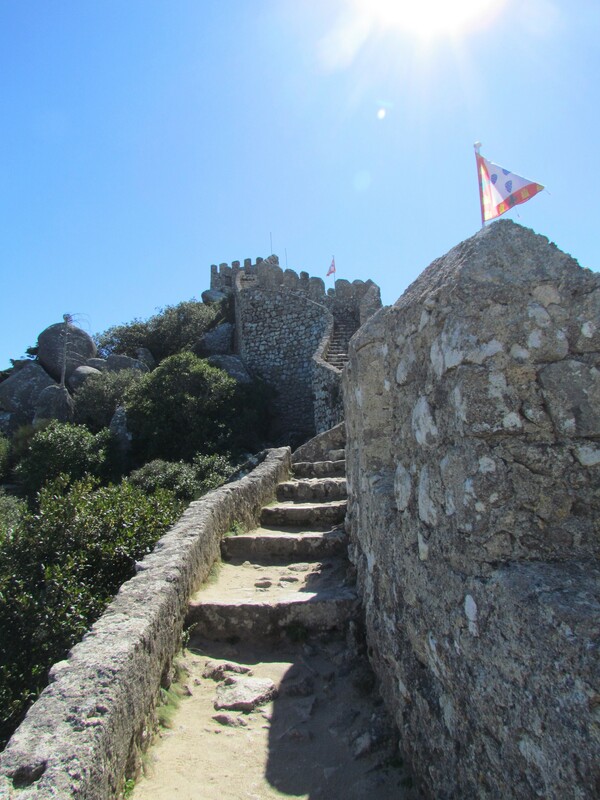 This Moorish Castle is huge, and it took us most of the morning to climb all the walls! You have to be in good shape because like most of Portugal the hills are steep. Also if you are afraid of heights this isn't for you. Can you see how far this castle goes? We made it from one end to another! There are great views so the climb was worth it. 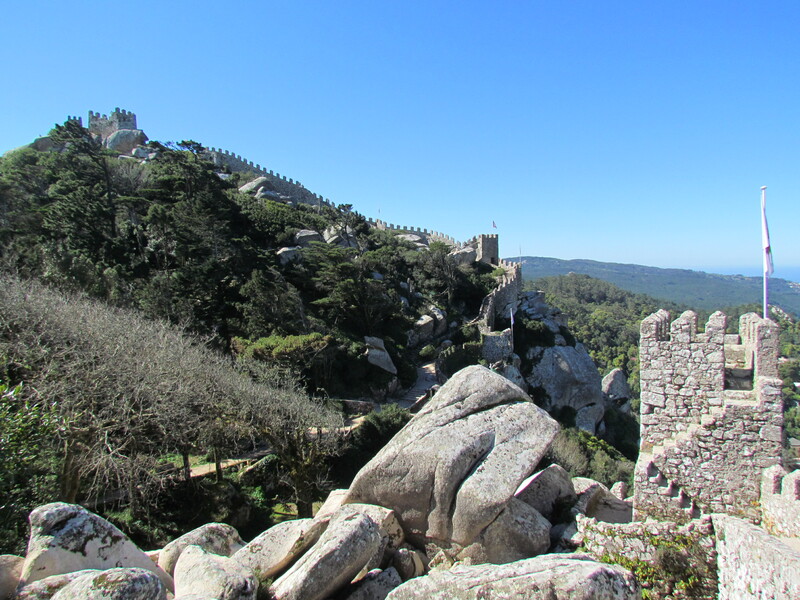 You can even see the Palácio Nacional da Pena from here. It's our next stop too. 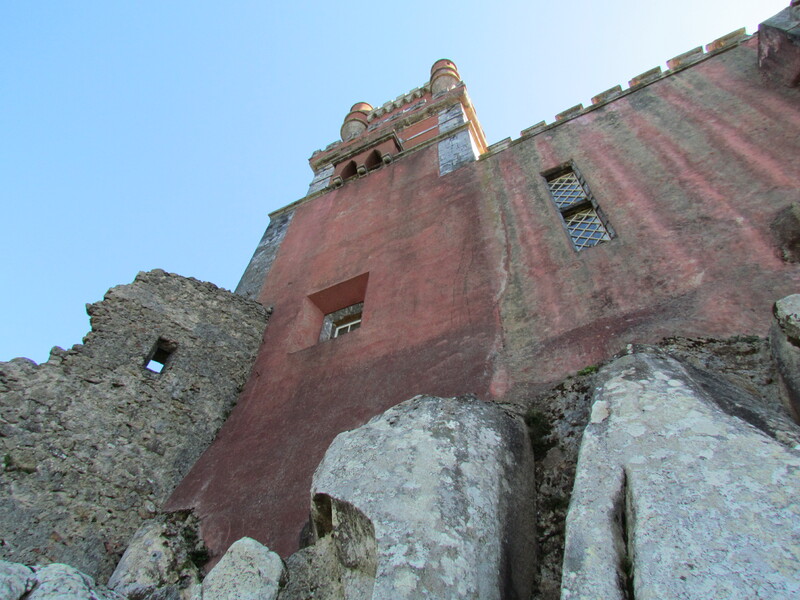 What makes the Pena National Palace unique you ask? Why its bold colouring of course! 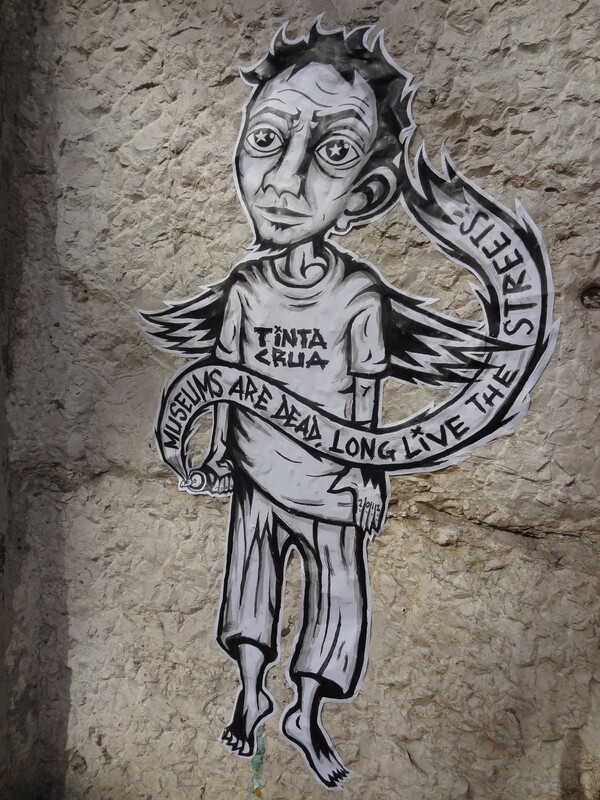 Of course like the other cities we have visited I have to end the post with some street art … can you see how this is different from the other street art we have posted? We came across this on our way to our favorite museum (The Gulbenkian)! Both Tony and I left our hearts in Lisboa, did you? What is LaserLeap technology you ask? Well … it is a project that young researchers are working on right now. It’s goal is to deliver medicine without using a syringe. 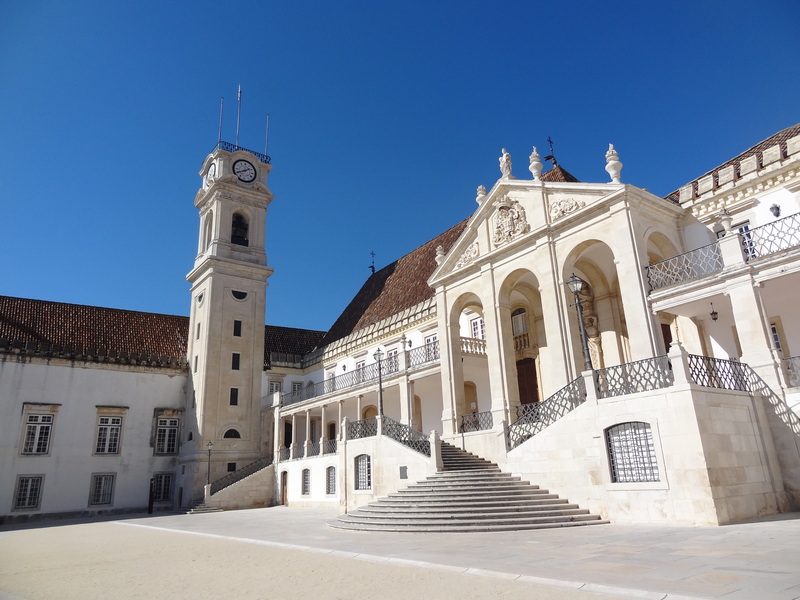 This cutting edge project is well underway at the University of Coimbra (Portugal). 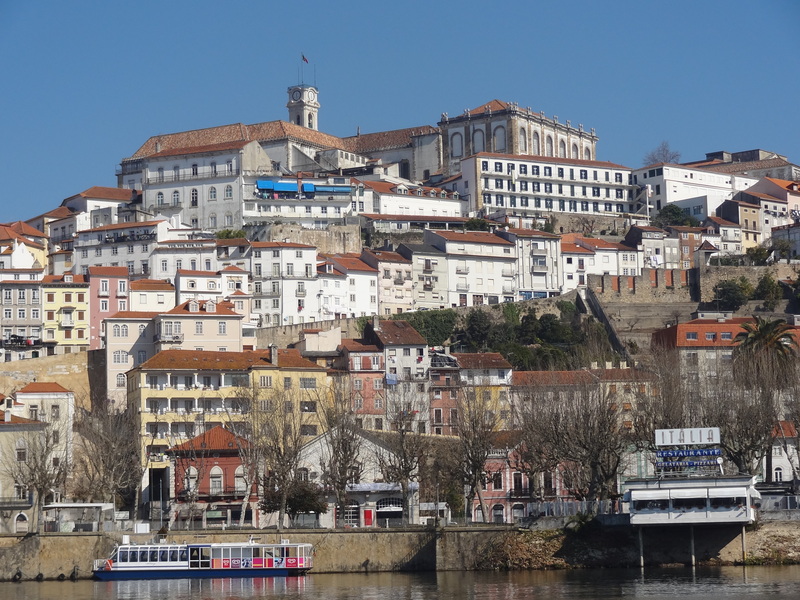 Coimbra is famous for one thing–more or less– and that is the Universidade de Coimbra. 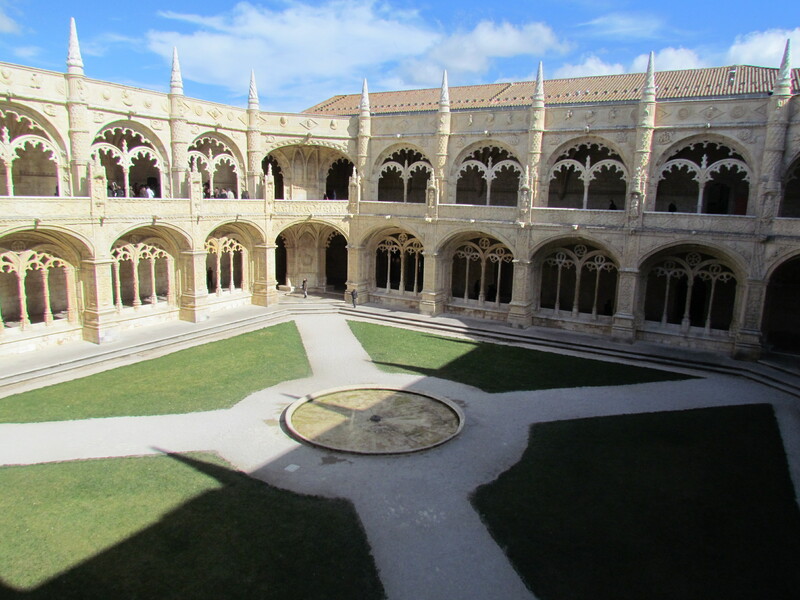 The locals simply refer to it as Velha Universidade or the Old University. 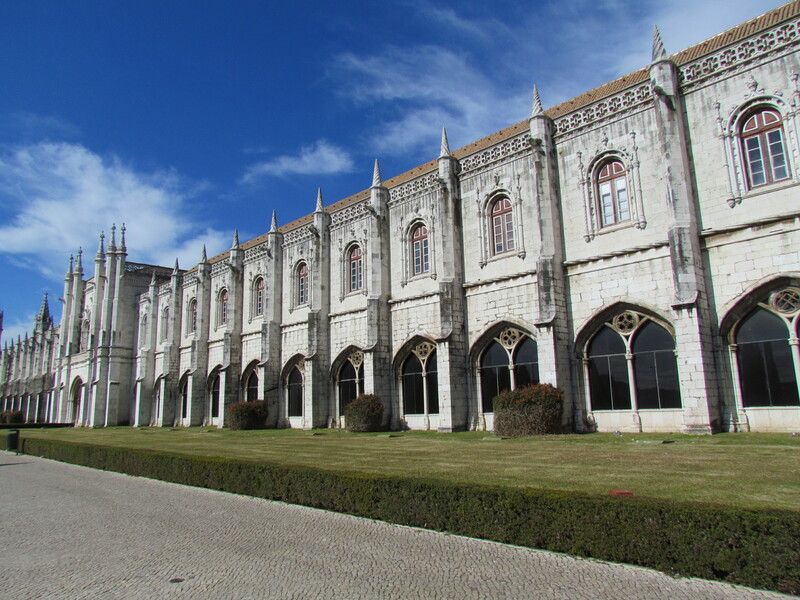 It is the oldest academic institution in the Portuguese speaking world. It was established in the late 13 century, thereby making it one of the oldest universities in Europe as well. The campus is located on the highest point of the upper town, where the royal palace once stood. The university is the citizens’ pride and joy, and from its vantage point it stands as a perennial guardian for the entire city. 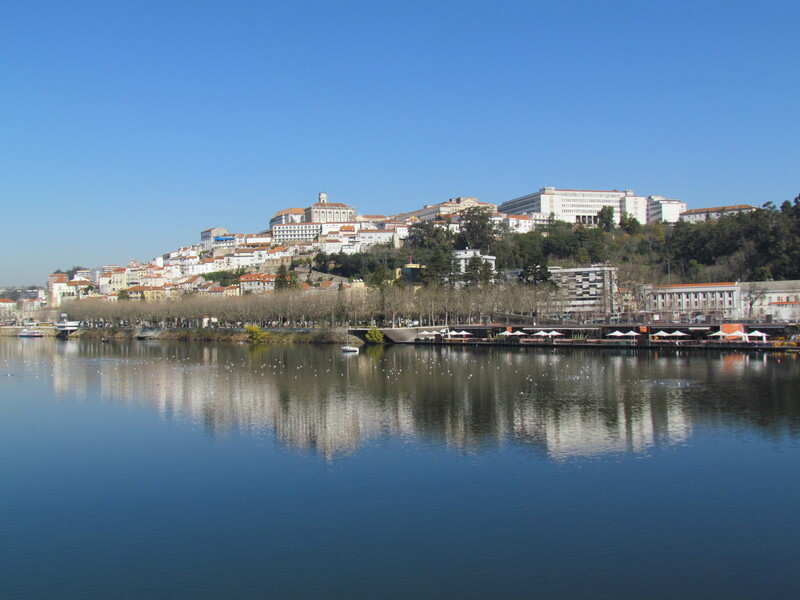 Coimbra has wonderful river views. The most popular one is of the river and University Hill (in the background). The highest point on the hill is where the university is situated. We walked along the river every day. The weather was incredible. +18 in February! At the top of the picture is the Tower da Cabra; it is found on the university grounds. After we climbed to the top of University Hill and visited the campus, we had a lovely meal at the Italia Restaurant (bottom right hand corner). The restaurant has great river views too. Crowning the top of the city is the university and its square. The original campus, along with the Tower da Cabra , is one of the most photographed places in Coimbra. The students refer to the tower as The Goat. Could it have this odd nickname because its bells constantly "remind" students that classes are about to start? This panorama captures the university's original campus including the bell tower and what remains of the former royal palace. To the left, you will find the entrance to the Joanina Library. The library is incredibly ornate. Of course we couldn't take pictures. The guard was ever present! Ironically the library also houses the university's old jail. If students did something illegal they would be kept there until their trial or until they sobered up! This is one of the city views from the university balcony (found at the back of the former royal palace). We love this picture because someone painted a message on the side of one the buildings below. Perhaps it was painted by a disgruntled student or two? Of course there is more to see than the university itself. If you have the time, you should wander the city’s streets too. You never know what you will see … wear comfortable shoes though … the city streets are steep. 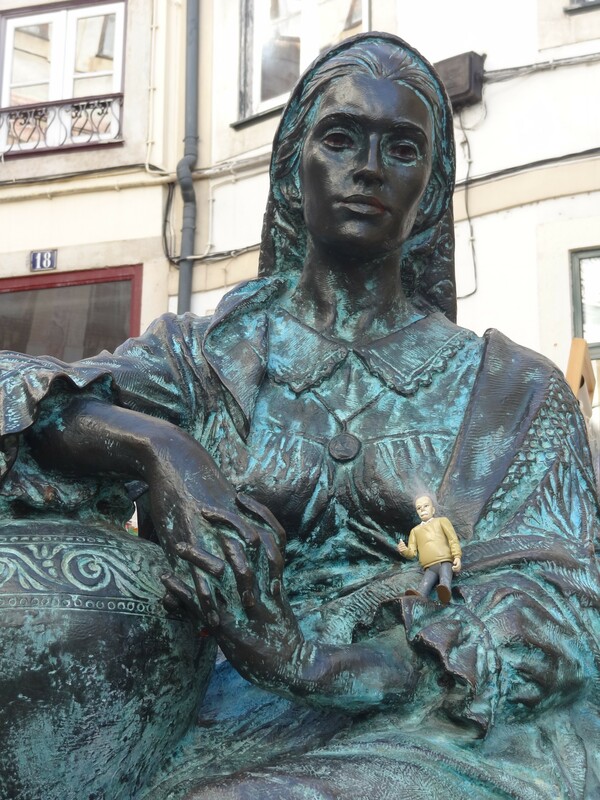 As Wade says, you will earn “buns of steel” after roaming Coimbra’s streets for a couple of days . Of course Einstein loved wandering the streets because he rode in my pocket most of the way. This is one of Coimbra's main squares. 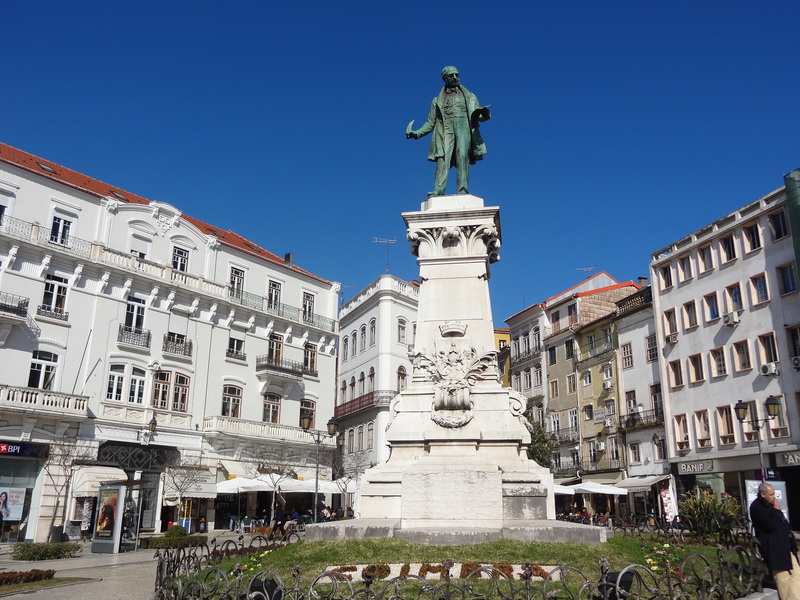 Largo da Portagem literally means "place of the gateway" and many assume it means that is the gateway to the city. 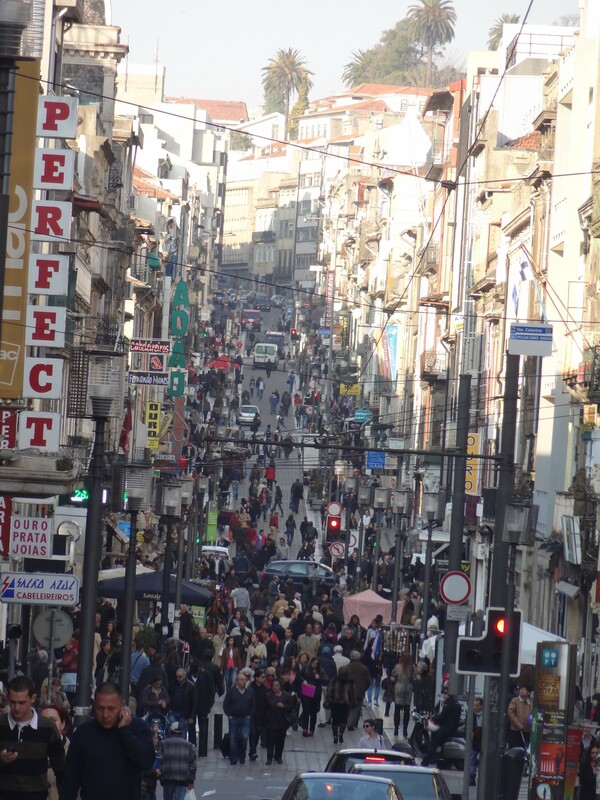 If you walk by the statue and up the slight incline you will discover Coimbra's commercial or shopping street. In the past the lower city was the commercial district too. It's fun to wander the city. So "get lost" -- let the city carry you away. 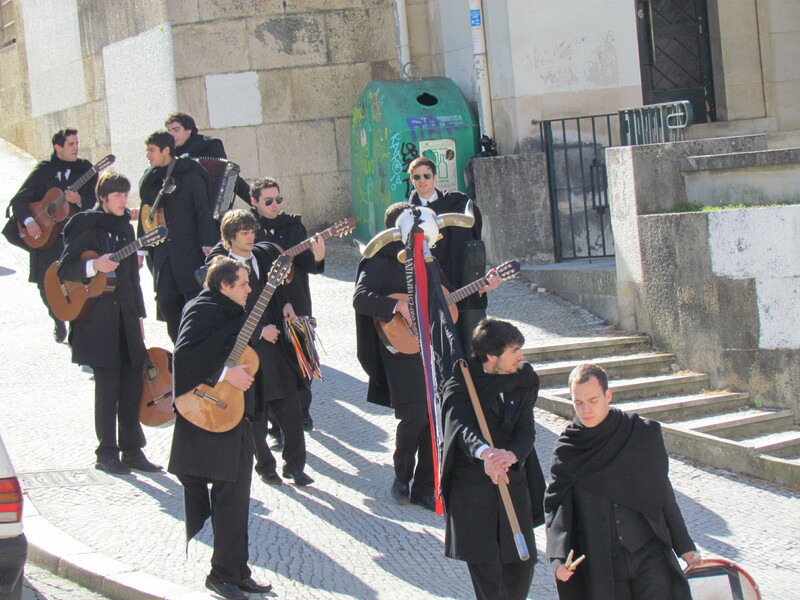 The Tricana of Coimbra literally means "wife of Coimbra". She is an important symbol in the city. In the past women like her would bring water or other goods, like eggs or bread, in her earthen ware jar from the lower city to the upper city. She provided an essential service to its citizens. The statue is placed in a spot where a typical wife of the city could rest before continuing her journey up the steep streets (under the Almedina Arc and up). 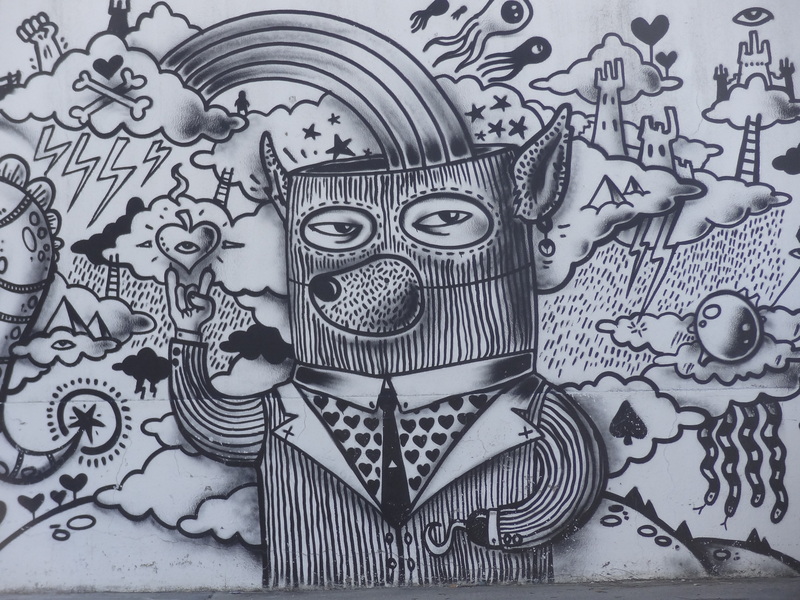 Like Spain, Portugal has some very interesting graffiti. We took this picture while waiting for the train to take us to Figueira da Foz. There is more to it--this mural covered a very long wall--but I like Mr. Fox! Don't you?